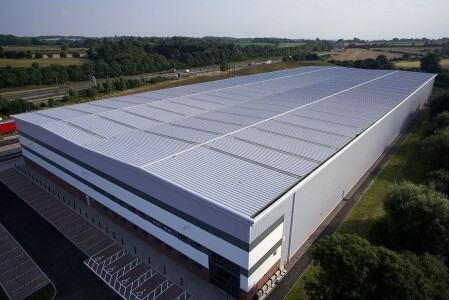 The final stage of a landmark warehouse scheme has been brought to life in Tamworth, making it one of the most prominent locations in the Midlands for warehouse and distribution operators. Completed in May 2017, Unit B at Centurion Park, which was commissioned by St Modwen, one of the UK’s leading regeneration specialists, forms the larger part of a logistics and distribution hub that covers a staggering 21-acre site. The focus for the project was to produce a highly functional building that was aesthetically identical to the adjacent warehouse, providing consistent building aesthetics and attracting businesses to locate in the area. Euroclad’s Elite roof and wall systems, including ridge-to-eaves rooflights, provided the matching, high quality, modern appearance that the project required. Specialist installers Hickton Construction chose Euroclad’s Elite 51 and Elite 60 vertical cladding systems for the walls which, together with the Elite Secret Fix SF500 roofing system, provided a 25 year full system guarantee. Euroclad’s high performance Elite Secret Fix SF500 roofing system, covering 12,100m2, provided excellent acoustic and thermal insulation, giving the roof an energy efficient U-value of 0.18W/m2K. The external roofing profile was manufactured using Colorcoat HPS200 Ultra® in Albatross, with ridge-to-eaves rooflights also installed over an area of 1,750m2. The walls, which had a 0.25W/m2K U-value, were made up of 5000m2 of Elite 51 and 623m2 of Elite 60, manufactured from Colorcoat HPS200 Ultra® in Albatross and Merlin Grey respectively. Ideally located adjacent to junction 10 of the M42, Unit B provides the opportunity for speculative industrial warehouse accommodation on a prime site, offering 14,215m2 of warehouse space with 24/7 access, parking for over 100 vehicles and two-level access doors. David Thornloe, from Hickton Construction which installed the systems and profiles, said: “This was a large-scale project that had to be completed on time and on budget using high quality products and having worked with Euroclad on many projects before, they were our first choice. options and colours. Founded in1981, Euroclad has maintained its cutting edge approach to high performance, cost-effective solutions to remain at the forefront of the industry for over 35 years.